West Heights UMC partners with the Kansas Food Bank to pack food boxes geared towards providing a safety net for seniors who experience food insecurity. Sponsored and endorsed by Senator Robert J. Dole, the program will help seniors who often face difficult choices between paying medical and utility bills and buying food. This program, started in 2012, has been designed with the needs of seniors in mind, and incorporates a new model delivery system that respects their character and dignity, while making access easier. This is not an entitlement just because someone is over the age of 65, rather the box is designed for seniors who are too proud to seek pantry or governmental assistance such as the commodity program. Each box contains shelf stable canned and dry items that seniors can prepare meals from. To learn more about this program, please click here. If you have questions about this mission program and would like more information, please click here - we will get back with you soon! 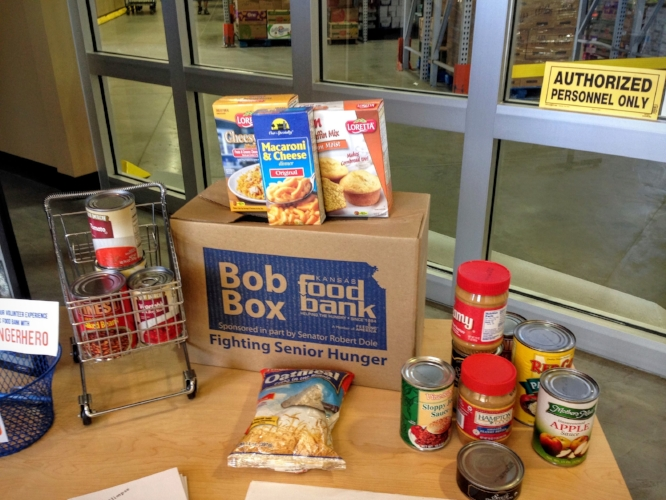 The Bob Box program operates year-around and opportunities to serve depend on the Kansas Food Bank and their schedule. Please click here to see what service opportunities are coming up soon! Would you like to see people in action serving God through the Bob Box Program? Check it out below!